Two scholars, M. Piattelli-Palmarini (1994) and C. Boeckx (2014), both openly “Chomskian”, have given two almost opposing assessments of the outcome of the debate : the former is a harsh critic of Piaget’s position, whereas the latter essentially shares it. This difference is due in large part to some recent developments in biology, in particular the so-called “epigenetics”. Giorgio Graffi (University of Verona) will focus on the relationship between Piagetian psychology, Chomskian linguistics and biology in the Royaumont debate, and over the following decades. 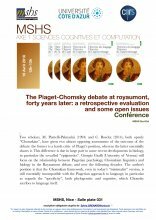 The author’s position is that the Chomskian framework, even in today’s “minimalist” version, is still essentially incompatible with the Piagetian approach to language, in particular as regards the “specificity”, both phylogenetic and cognitive, which Chomsky ascribes to language itself. Giorgio GRAFFI, University of Verona.